…without a colour in between”. Or so the saying goes. Pretty much the pinnacle of controversy in Interior Design in my opinion! I personally think these colours work well together and are the main stay in any British Summer view; think green rolling hills and blue skies – it’s a classic! These colours have been readily available to combine in your home for the last few years under the ‘Scandi’ trend umbrella and even more so at the moment, with the Jungle trend doing the rounds. Photo credit: Designrulz. A very livable space. I love the use of different grey and neutral tones and stone, wood and metal textures which tone down the brighter accents and tie a big room together. Photo credit: Kit Kemp bedroom for the Ham Yard Hotel in London. 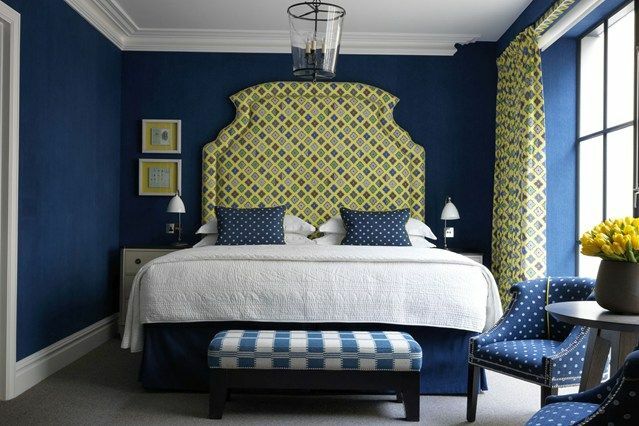 I flipping love Kit Kemp anyway, and I absolutely love this indigo and lime scheme. Really dramatic in quite a small space. Photo credit: Annie Sloan Home. Shows that this colour scheme doesn’t have to be super glam. 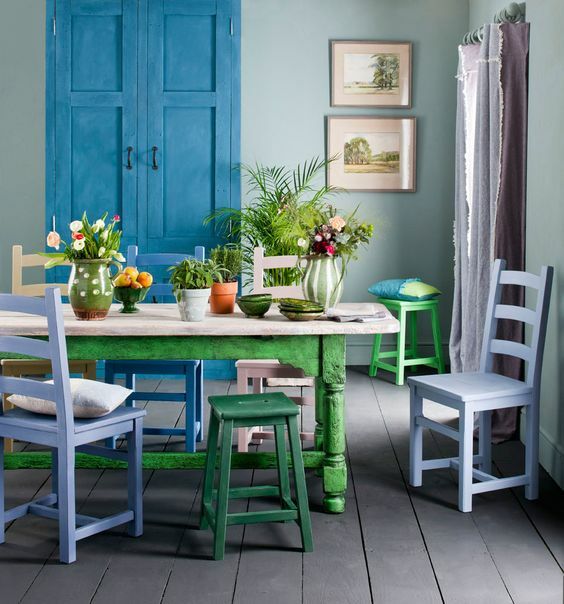 The combo makes this rustic dining room feel very country-chic and Summery. Lovely. Photo credit: A Kelly Berg bedroom design. Given the colour scheme, I love the Peacock-y references with the paisley cushion and decorative headboard. Very restful. Brian Del Toro design, New York. The use of geometric shapes and sharp edges across the furniture and accessories (check out that mirror!!) brings the contrasting colours together. The gold adds a sense of luxury and solidity to a contemporary scheme. Left to Right – John Lewis Prism Blue cushion, £25 / Next Wool Blend Diamond Geo Rug, from £40 / Scion Cedar 120354 fabric, £30/m. For a truly Scandi design, keep the furniture minimal, slightly retro in shape and light wood in finish. Light silvery grey is very much the neutral of choice and use bright white accessories to finish things off. What do you think of this colour combination? A fan of Scandi and want some more ideas? Let me know! This entry was posted in Inspiration and tagged Annie sloan, blue and green, controversy, Kit Kemp, scandi. Bookmark the permalink.